Keen to learn how to build websites in ASP.NET? Microsoft Web Platform has the answer. The entire Microsoft Web Platform includes Visual Web Developer, SQL Server Express, Silverlight Tools, IIS and ASP.NET Extensions which are just what you’ll need to get started. I had just tried the installation over the weekend and all went well. The screenshot below shows one of the screens where you can choose what to install. 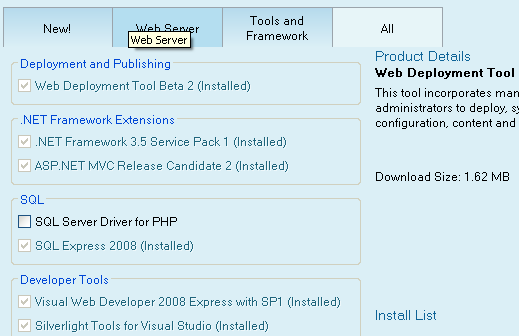 Yup, there’s support drivers for php to interact with sql server express and ASP.NET MVC is currenty in RC2. I haven’t develop anything in ASP.NET MVC yet but love+practiced some of the MVC pattern in CakePHP, and having read some doubts about asp.net MVC, I’m just curious and wanted to test how Microsoft will do its MVC magic in ASP.NET. BTW, from my 20 minutes of testing the water, I have to mention that desinging CSS in Visual Web Developer is pretty cool. Instead of memorizing what css syntax there are, the build style wizard allows you to look at an interface and choose from dropdowns of what stlyes you would want to apply to your html elemets, classes and ids. This can be really easy for novice css/web developers to pick up and I see it as a real time saver. This video sums up what I’m trying to say. Previously LAMP developers might complain about how hard is to get things installed and configured in order to start developing in ASP.NET. Now, with Microsoft Web Platform, that’s not an excuse anymore.